"If kids in cages is too much for you to defend, you could resign"
Whether you’ve been paying attention to the news or not, it’s likely you’ve heard about the Trump administration’s newest policy of keeping kids in cages. Outrage has been rising across the country as more details emerge surrounding the administration’s zero-tolerance policy that is seeing families separated at the border and children being placed into what essentially amounts to baby jail. That’s right, just when you thought it couldn’t get worse, the United States of America is running baby jails now. On Monday, Oliver Darcy, a CNN reporter, tweeted that White House Press Secretary Sarah Huckabee Sanders would not be participating in the daily press briefing, as she did not want to field questions concerning the widely criticized zero-tolerance policy. 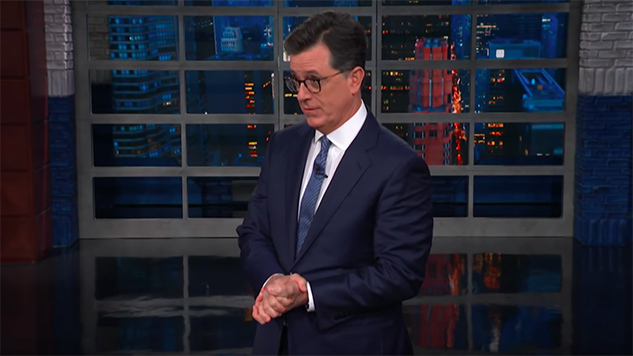 And on Tuesday night, Late Show host Stephen Colbert ripped Sanders a new one for essentially opting out of doing her job. A White House official tells @jeffzeleny that @PressSec didn’t want to do the briefing today amid questions on child separation policy, so @SecNielsen is being flown in from New Orleans to take questions. For Colbert, there are only two ways that you can feel about this story: You can either “be horrified, or you can work for Donald Trump.” Watch him rip into Sanders, Nielsen, Laura Ingraham and Trump himself for hugging the American flag in the full segment below.